Now your customers living near your physical store will be able to order using your online store and pay and get their goods in your physical store when it’s ready. With this module you will avoid extra work in your physical store, allowing customers to go there just to pay and get their ready to go orders. You’ll be able to spend more time on customers not using your online store or promoting your online store. 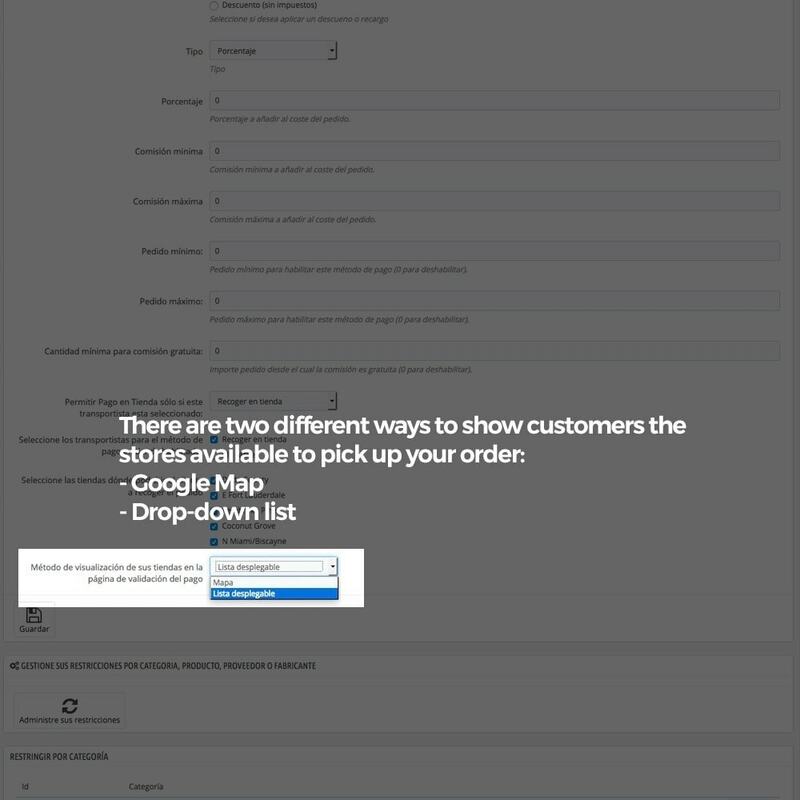 The best way to simplify the orders of your customers. 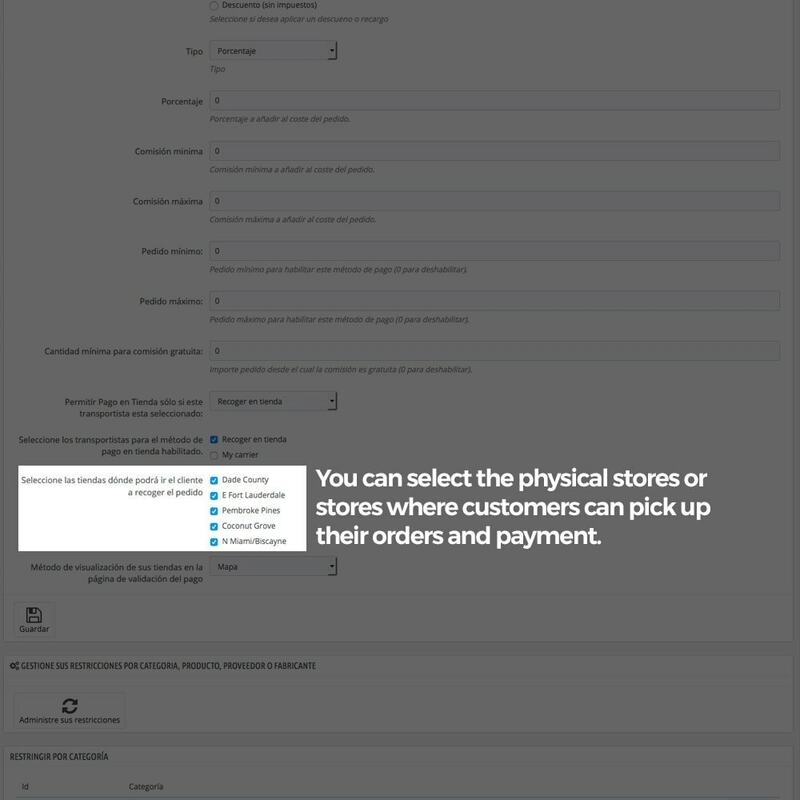 Now if you have a chain of physical stores, you can give the option to your online customers, to pick your orders in any of your physical stores. When placing their orders, customers will be asked about the shop to collect and pay their orders. 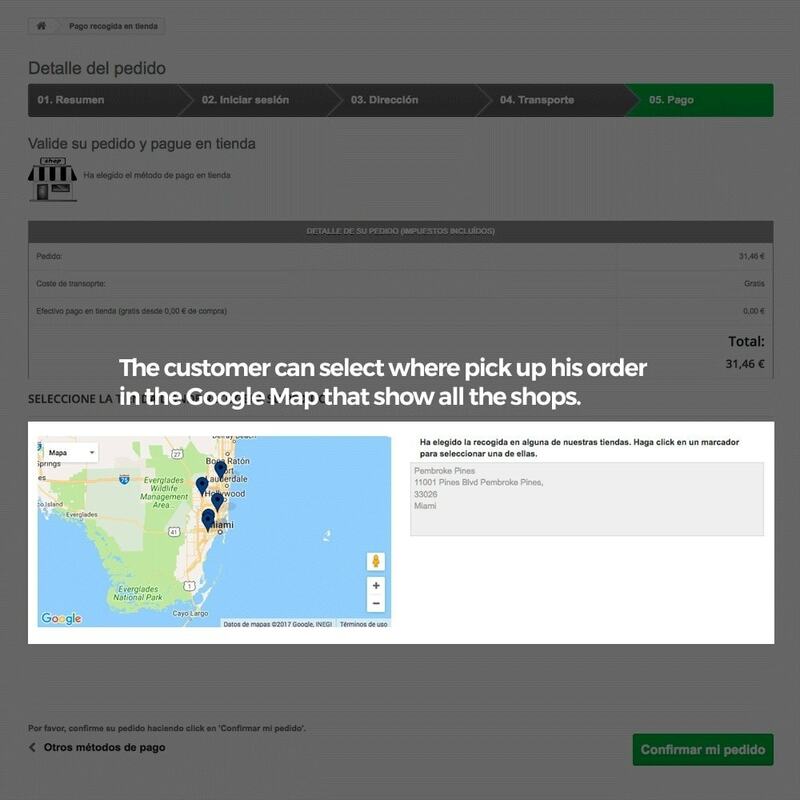 They will be able to use the stores selector or select the store directly in a Google Map displayed while placing the order. You can add as many shops as you need by using PrestaShop Stores section. Make your customers save the shipping costs. Your carts will get bigger if they are free of shipping costs. But if you need it, you have the option to add a fee to this payment methods in order to cover manipulation or preparation costs. 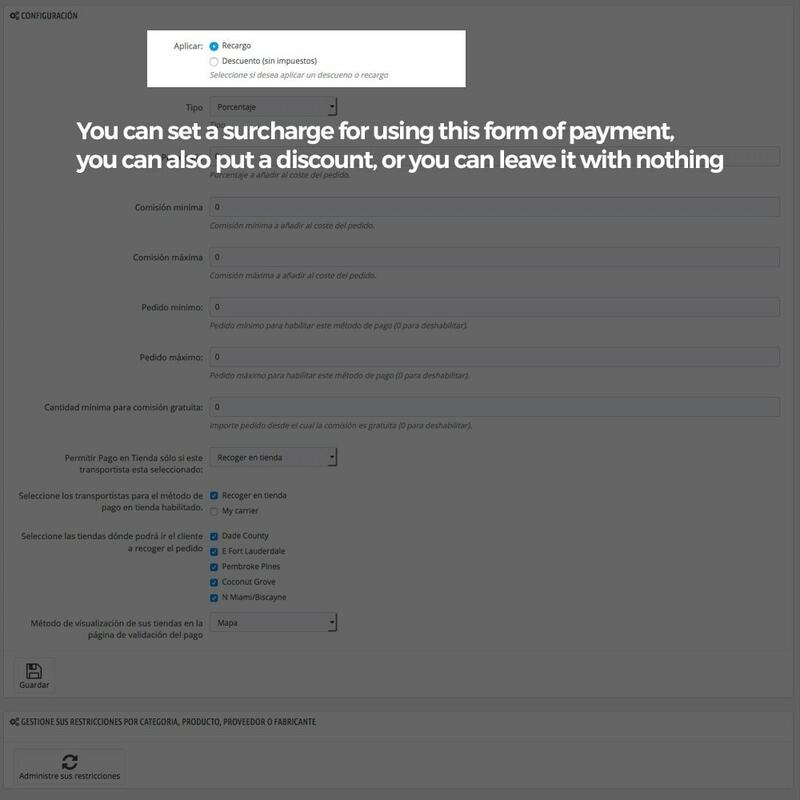 This PrestaShop module allows you to configure a fee in quantity, percent or both. You also have the option to put a discount to this form of payment if you want to motivate your customers to go to your physical stores. 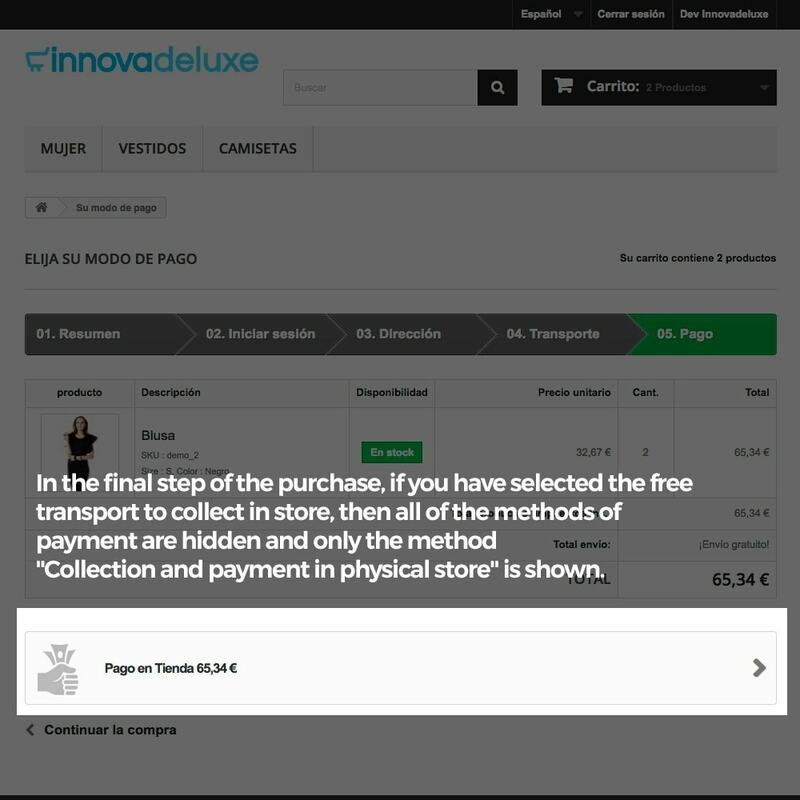 This really is a great idea, since your customers buy from the online store and they spend on the order just what they want on the products they really need, but if they then go to your physical store to pick up the order, it is very possible that decide to take some other product, which will get 2 sales in one. 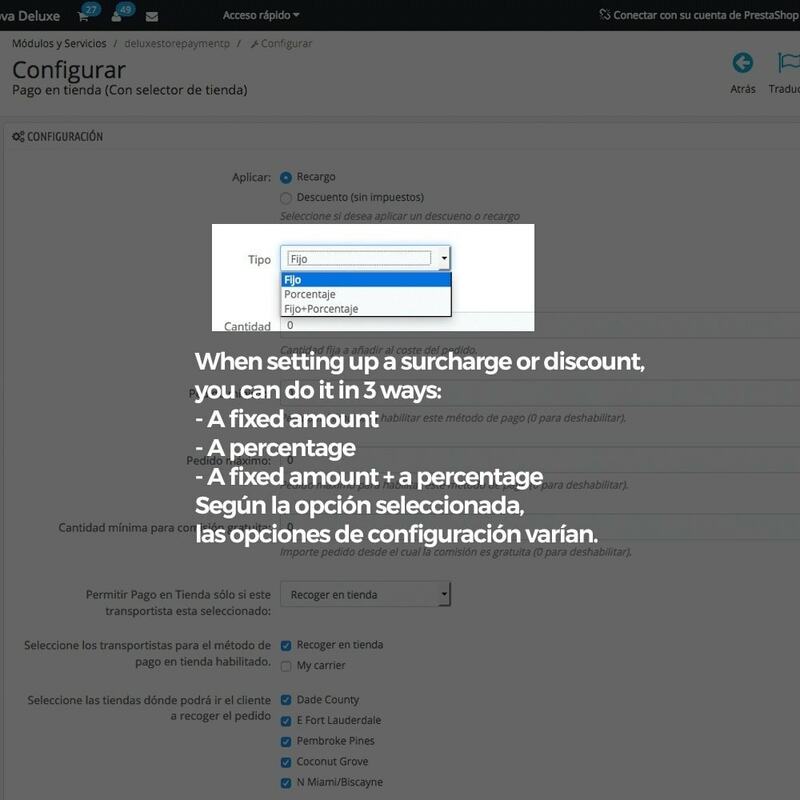 Just as with the surcharge, with the discount, you have different ways to configure how it is applied. 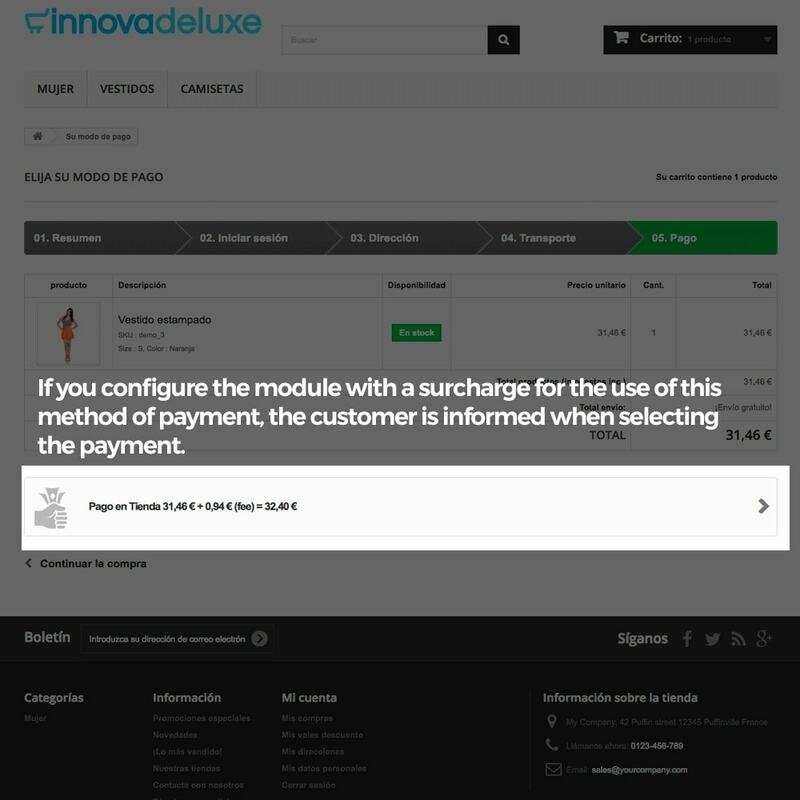 This module will create a a new order state called “Waiting for store payment”, having an order reference, but not creating an invoice before payment. 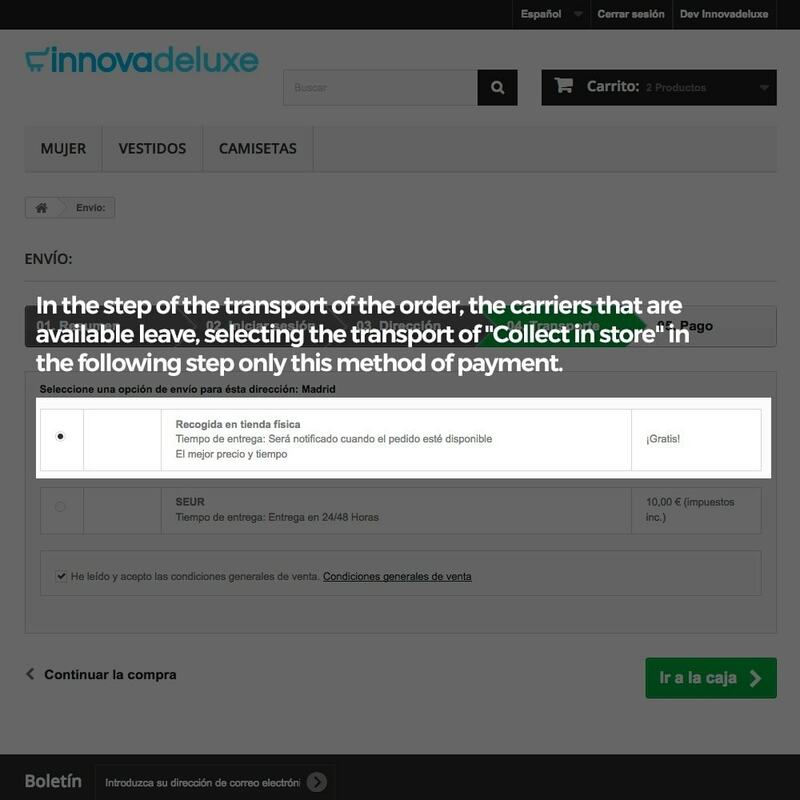 Are you using InnovaCommercePOS in your physical store? 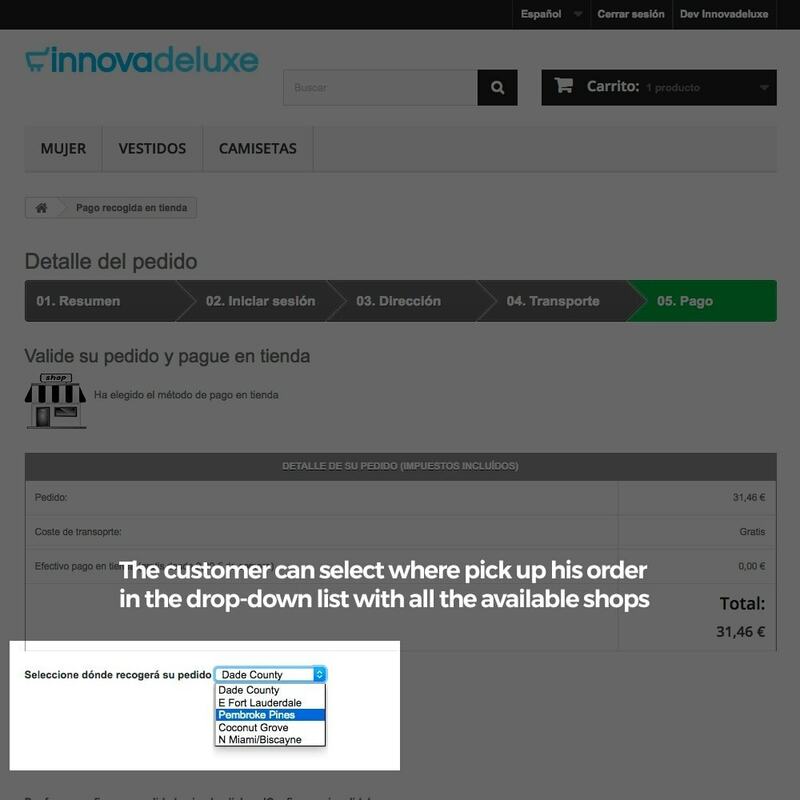 With this module you’ll be able to manage your web orders in the POS in a simple way. 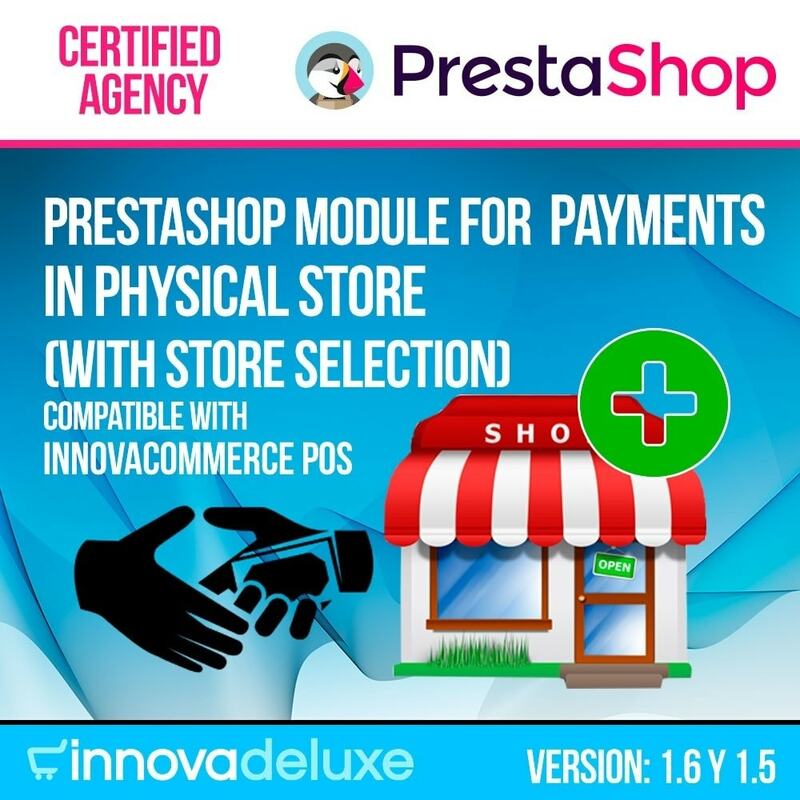 If you don’t know InnovaCommercePOS yet, take a look to innova-commerce.com, the best POS for physical stores working with PrestaShop in real time. The best addon for your PrestaShop store. 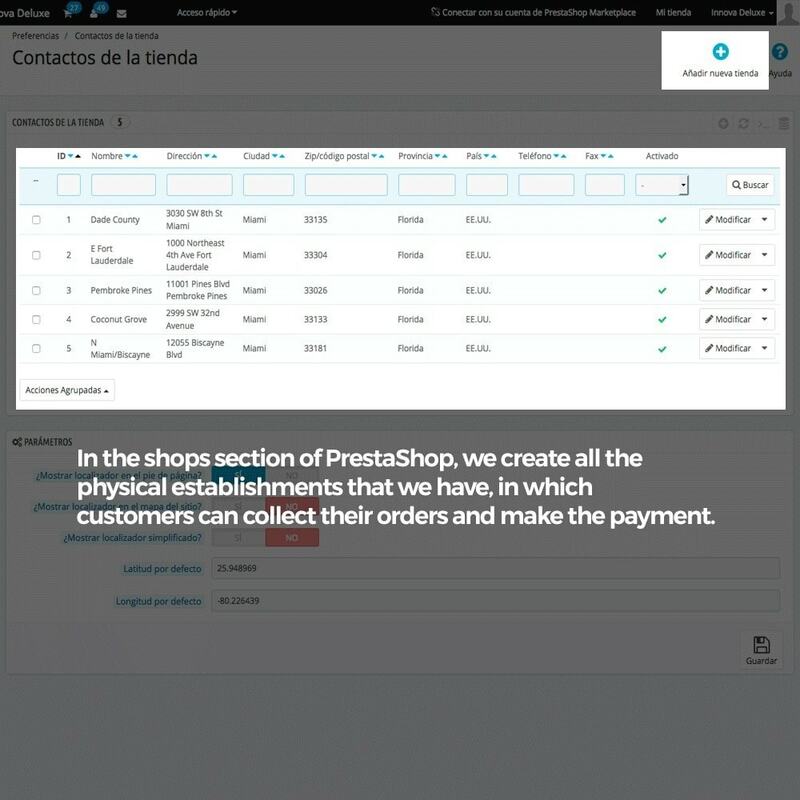 With this module your customers will not pay until they get their ready order in your physical store. When a customer selects this payment module, the physical store address will be displayed to the customer in order to go and get his order. 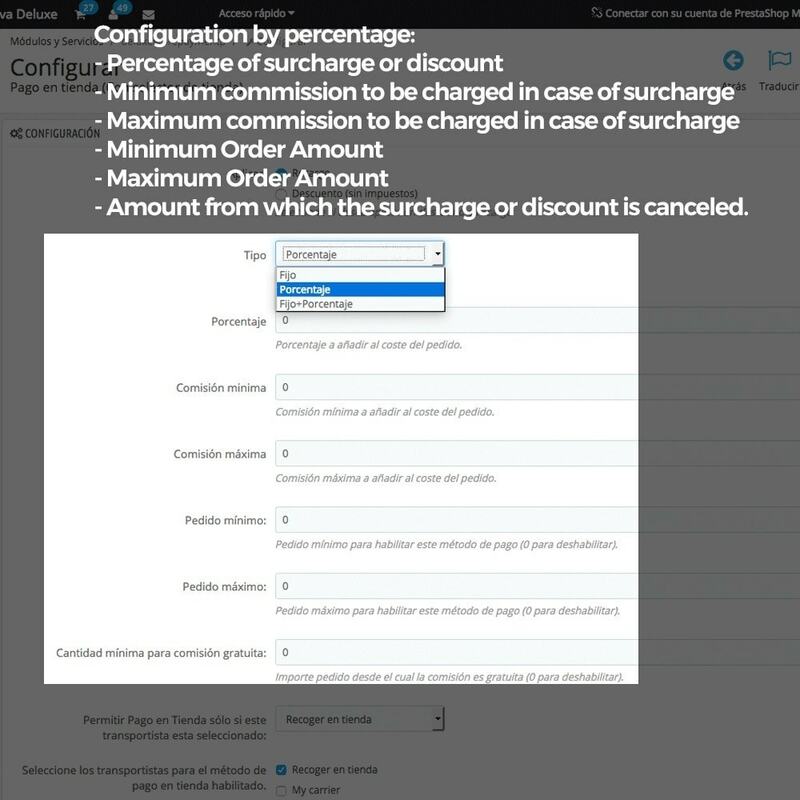 The "pay and collect in store" module allows you to apply a payment with a fixed surcharge plus a percentage, which allows you to set a certain surcharge easily. In the same way, it allows to apply a discount on the total of the product by using this method of payment. 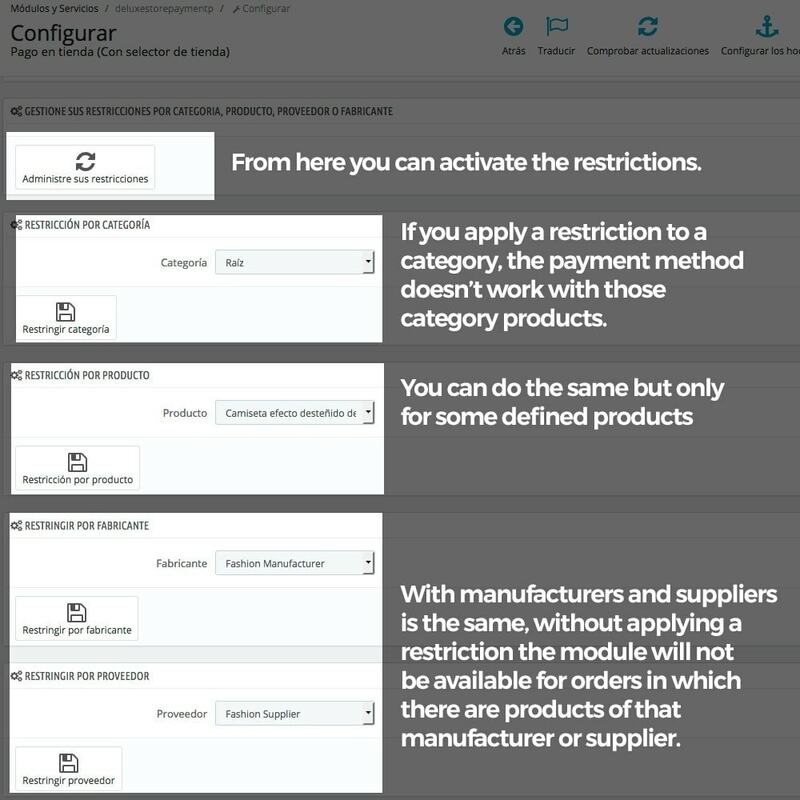 In additon to this, this module includes filtering and restrictions for categories, products, manufacturers and providers. 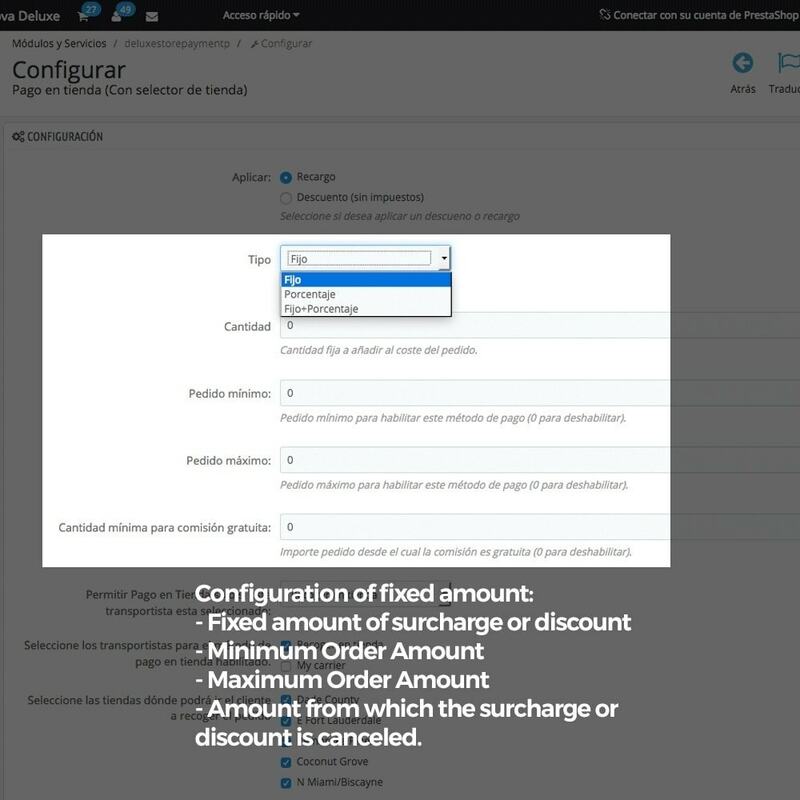 Store payment module allows you to to have especific configurations and restrictions for this payment method. 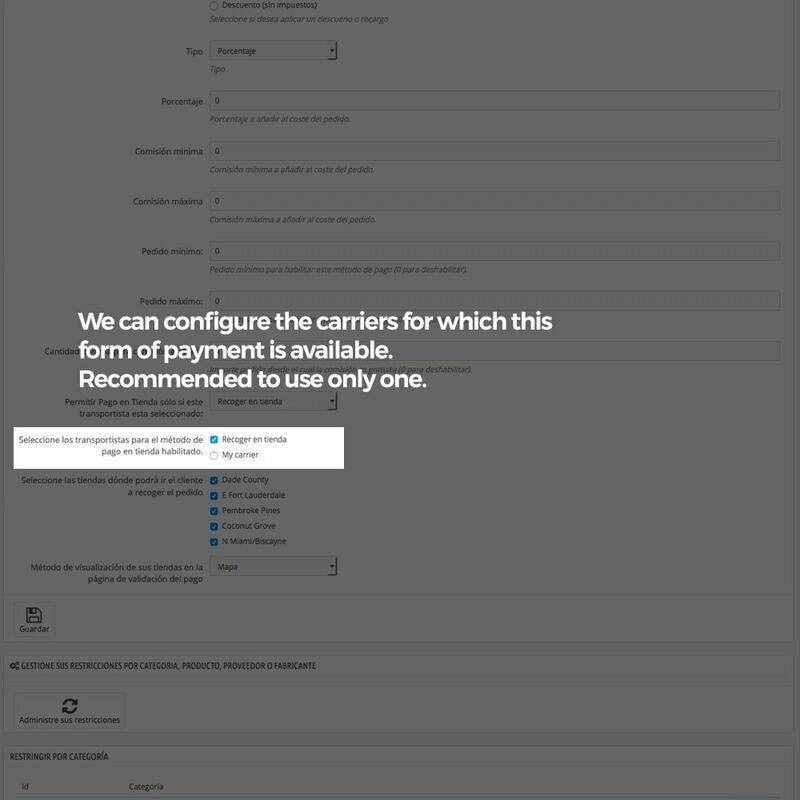 Configure the carriers with this payment method active. 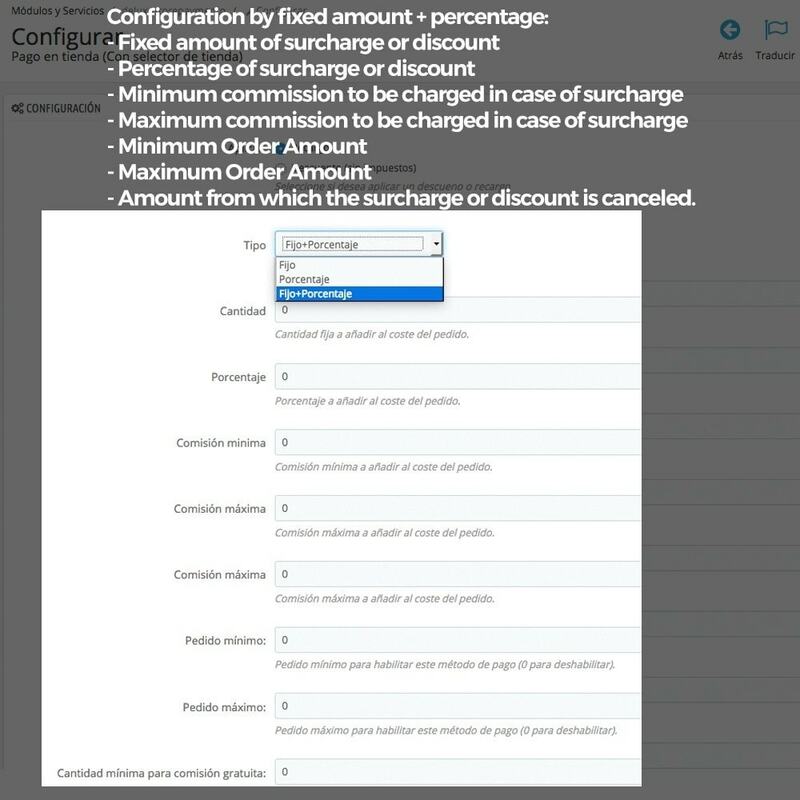 Allows you to hide all other payment method if a specific carrier is selected for order. Selector of stores in the frontoffice for the customer decides where to pick up his order. Complete compatibility with PrestaShop's physical store system. 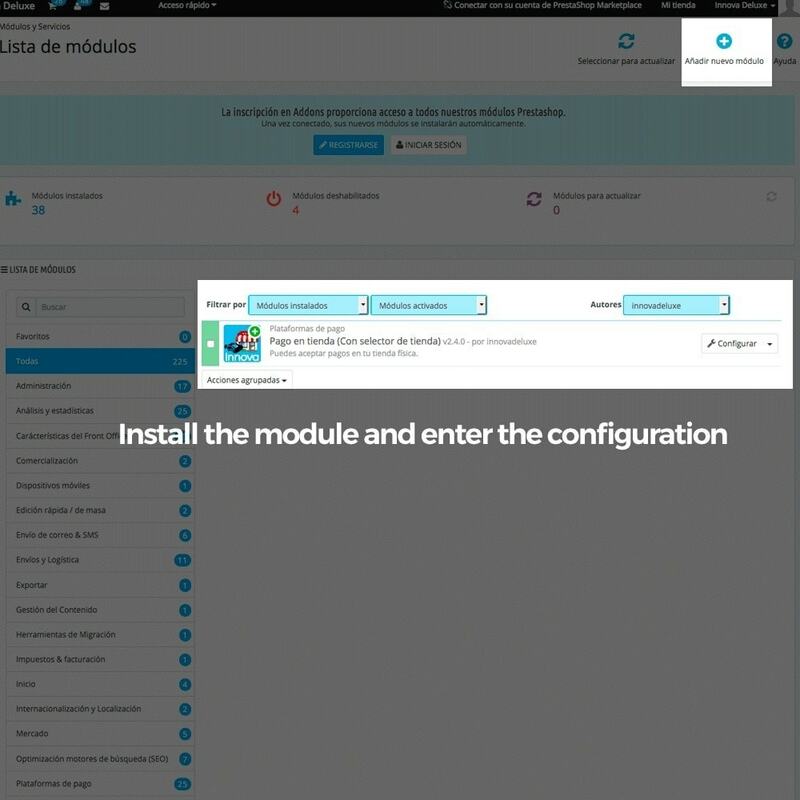 With this module you can hide all the forms of payment except this if you configure in the module a specific carrier. 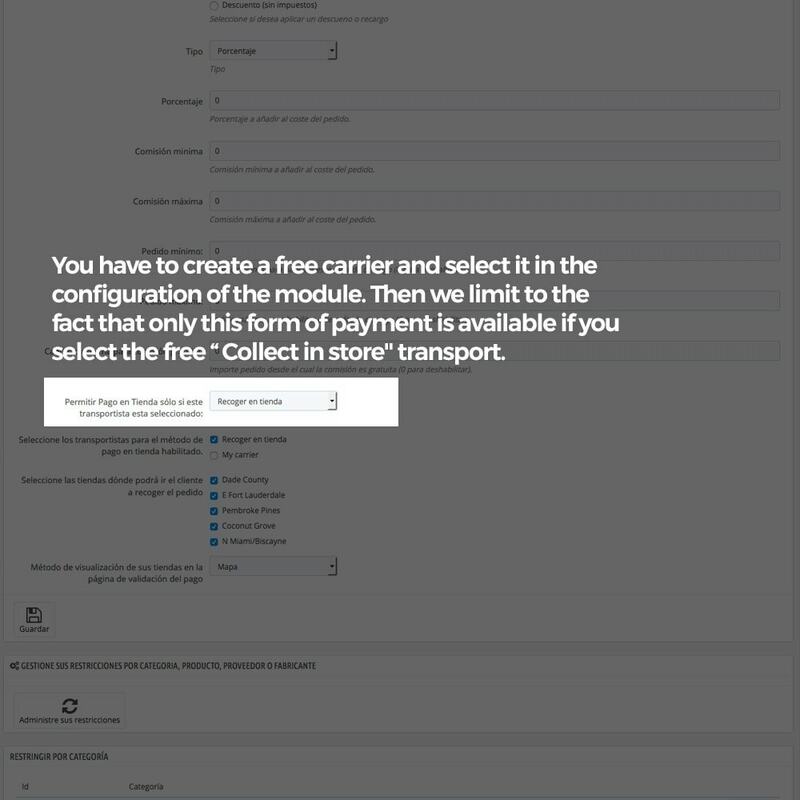 For example you can create a free carrier (Collect in store) and if a customer selects this carrier, the only allowed payment method will be “Store Payment”. 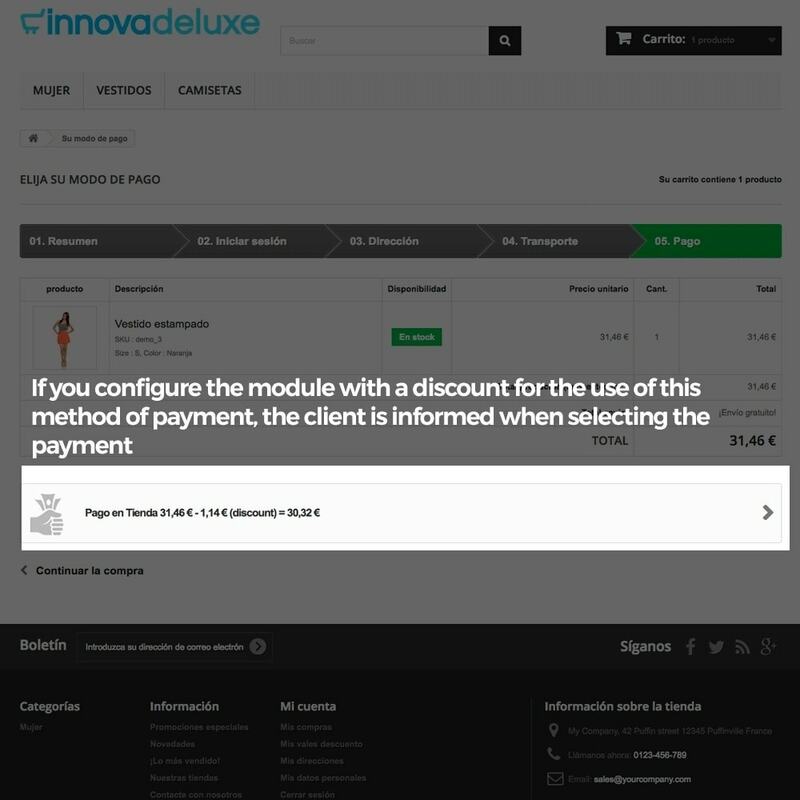 Also, if you have our POS software, InnovaCommerce , this module is complemented perfectly, showing the state in your POS InnovaCommerce and once the payment has been made through InnovaCommerce, the order is marked as paid. Now your customers can save waiting time in your physical store. They’ll be able to order their goods in your online shop and get the goods ince they’re ready in your physical store. Your customers will save money as they will not pay any shipping costs, they can get the orgers themselves in your physical store. Your customers will trust your online store, as they’ll see there is a physical store behind it, where they can go to get their goods or ask for a refund. Give your customer another option for secure payments adding the store payment module to your shop.